Become part of the neighborhood! 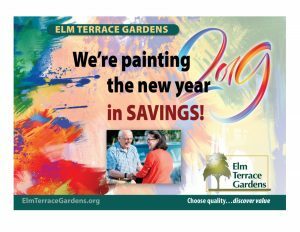 Unlike many other retirement communities, Elm Terrace Gardens is located “in town” right in the heart of downtown Lansdale. With public transportation less than 30 feet from our doors and a regional rail line a half mile away, the world is your oyster. Unlike other communities in very rural locations, here at Elm Terrace you don’t need to drive to enjoy all of the things you do! See the many attractions, restaurants and activities that await you in Elm Terrace Gardens.